Hey, dumbass, stop stepping on my toes. We neither want nor need you input. The Octopus hate the west as much as they hate you - not because you are batshit crazy but because you are human (allegedly). GAH! 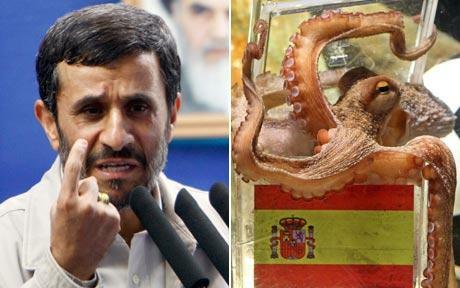 "Mahmoud Ahmadinejad, the Iranian leader, says Paul the Octopus, the sea creature that correctly predicted the outcome of World Cup games, is a symbol of all that is wrong with the western world. He claims that the octopus is a symbol of decadence and decay among "his enemies". Paul, who lives at the Oberhausen Sea Life Centre, in Germany, won the hearts of the Spanish by predicting their World Cup victory. However, the Iranian president accused the octopus of spreading "western propaganda and superstition." Paul was mentioned by Mr Ahmadinejad on various occasions during a speech in Tehran at the weekend. "Those who believe in this type of thing cannot be the leaders of the global nations that aspire, like Iran, to human perfection, basing themselves in the love of all sacred values," he said." The whole speech is a bluff -- a misdirection. I know this because I know what most people do not. Namely that years ago Mahmoud Ahmadinejad's brains were forcibly removed by octopi agents and replaced by one of their own. This fiery speech is just to throw off suspicion. Don't be fooled! WHOA, I almost WAS fooled there until I tuned my viewscreen to filter out the human speak and tune to the octopi frequency. Now everything makes sense again in my world. Plotting east against west again? That plan didn't work in the cold war and it won't work now. Though I hope we can at least clean out their 'infected' leadership in Iran before we move on to other business. Good catch buddy. Ah. Sacred values like stoning women to death. Paul the octopus is pissed because the humans named him "Paul". This is not an appropriately menacing name for an octopus.